Can Piemur prevent a war that pits dragonrider against dragonrider? What an awesome addition to the world of Pern! Gigi McCaffrey has done her mother proud! Menolly, Piemur, and Jaxom have been my favorite characters in all the Pern books. How wonderful to have a new Pern story starring Piemur with parts for our other favorite characters, although a few, such as Lessa and F’lar, are almost cameos. Dragon’s Code takes up where Piemur’s changing voice left off. He’s now a wandering journeyman mapping the southern continent and spying on the Oldtimers exiled there for Masterharper Robinton. As usual, although more serious and mature than in the previous books he shares with Menolly, Piemur is in the thick of things. He manages to insert himself where he can hear the plotting of disgruntled Southern dragonriders as they plot a way to get themselves out of a dead-end exile, where their female dragons are too old to fly to mate and they and their dragons are ill from an unknown lung disease. They are depressed, angry, and ready for rebellion, their days of heroically traveling through four hundred years to save Pern a distant regret. They’re ready to do whatever it takes to be in power again, even if it means betraying other dragonriders. It will take all Piemur’s wit to save them, Sebell, and himself from the dangers and enemy plans afoot. 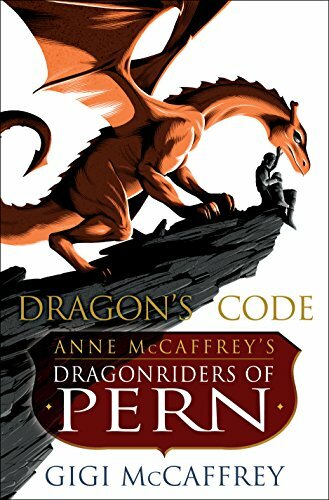 This books stands alone, even though incidents in the story originally occurred in other Pern books and this story explains what was happening behind the scenes that created those incidents, who the perpetrators were, and how everything turned out in the context of Pern as a whole, since the other books were limited by their POV. If you love dragons, fantasy, or Anne McCaffrey’s Pern, you will love Dragon’s Code. Highly recommended.